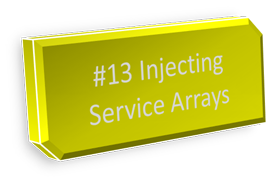 So this time we're going to look at injecting service arrays ... if you haven't read part 12, it might pay to have a look at that first - this part follows on from the examples presented there. So this should be reasonably quick, we're just going to rework the Part 12 solution so we don't need decorators... why would we do this, well in this case I feel that rewiring decorators (ie. changing orders, or disabling one of the decorators temporarily) isn't completely intuitive, especially when you have a long chain, it's easy to make mistakes. Notice the default caculator now takes our 3 calculators as members of an array, and if we want to change the order in which they are evaluated, it's trivial to just move them around within the node, or to comment certain ones out. The next part will have a quick look at the "Startable" facility, enjoy. 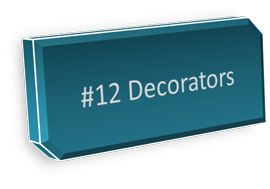 So... Decorators (for those who don't know, or don't remember) are a classic design pattern - have a look at the wikipedia entry if your curious on doing any background reading. Notice it's dependency on ICostCalculator, and that it actually invokes the inner calculator to get a total and then "decorates" the total (by adding the 12.5% when the country for the order is New Zealand). Great, so our New Zealand order is now ($110 * 1.125 = $123.75) - but our United states order is still at the original $10 dollars... but we forgot to calculate shipping... so let's add another decorator. Now there's a small problem here... we're calculating GST before shipping, this actually should be the other way round... think about what you would have to do to change this in a program normally - ugh! But of course decorators and IoC containers are a great fit, we'll just change the order of decorators, and while we're at it, lets make GST 20% and no longer charge a premium for shipping fragile goods... easy! Now one thing to keep in mind is that so far we've been decorating return values... but you can also decorate methods with logic that occurs before invoking the inner service - a common example of this might be to validate something before it's committed to a repository (and perhaps throwing an exception if it's not OK) - and now suddenly you can turn validation on or off at the configuration level. Next time we'll have a look at another way of writing this functionality without using decorators, stay tuned. All dependencies to be registered in the container. injected via constructors, or properties. Which is fine for classes you own, but what about those that you don't - well you have a few options, but one of the easy options is to create a factory and get the container to use the factory for creating instances - to do this we'll be using a facility. Facilities are "add-ins" for the container, they can be registered in the container, and augment what the container is capable of doing - there are a lot of facilities for the container, and many of them are documented (to varying degrees) on the castle project wiki ... we will be using a couple of different facilities in this part, first off will be the factory support facility. Ack! Which doesn't fit in nicely with our concepts of constructor and setter injection for configuration... so the answer is first off, to write a factory... can you guess what it'll look like? Notice that we've registered our factory as a component, and called it smsService.Factory - and then we've registered the smsService.default (interface only) and added a couple of additional attributes, factoryId (which references our factory component) and factoryCreate - the name of the method in the factory which is responsible for creating instances of our sms service. Because we now have the factory support facility installed, whenever a component is registered that facility will inspect it and see if the factoryId attribute appears in the components configuration and consequently defer it's activation to the referenced factory - pretty cool huh? At this point I was going to take a quick look into another factory-related facility, the TypedFactory, but it's currently broken in the main trunk ;o) so we'll wait until that's been resolved before finishing off this post. Next time we'll have a quite look at revisiting a class design pattern, the decorator, when using the Windsor container. And update the secret message sender to use this default formatter... by default! Now notice we automatically create a default formatter for the class to use... so at this point we can run the program just as in part 9 (Without having to make any changes to the container configuration) and everything works as it did... however, we can also optionally override the message formatter by registering an implementation in the container... the MicroKernel is smart enough to discover any publicly accessible properties with setters, look for any implementations, and inject them if they're registered in the container.